Description: We first encountered this English composer in Feb. 2011 (02M012) with a disc of his first symphony and two other orchestral works and marvelled that such immediately communicative, tonal music could be so unknown. Well, here's some of his equally attractive chamber music, two violin sonatas from opposite ends of his career: the First (1969) a generally dark and uneasy piece originally written for viola which, at times, sounds like something Frank Bridge could have written just before his post-WW I stylistic change, and the second, written for these artists in 2011, in which the same harmonic language and rhythmic energy is present but in a much more evolved form, artfully mixing "serious" with "skittish" neo-baroque moments in the first movement, playing with atonality which still sounds quite tonal in the slow movement and a playful and virtuosic 6/8 finale. 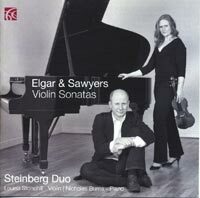 Louisa Stonehill (violin), Nicholas Burns (piano).